As the film adaptation of a popular Tony Award-winning Broadway musical with the same name, “Jersey Boys” is a muted experience seriously lacking spark and energy. As a jukebox musical movie, it surely serves us with many recognizable songs from the real-life musicians whose life and career the movie and stage play are based on, but the movie just keeps warming itself up as following its thin narrative which always gets its deficiencies exposed whenever the music exits. It finally finds some sparks after the finale, but, boy, it is too late for the boys as well as us. 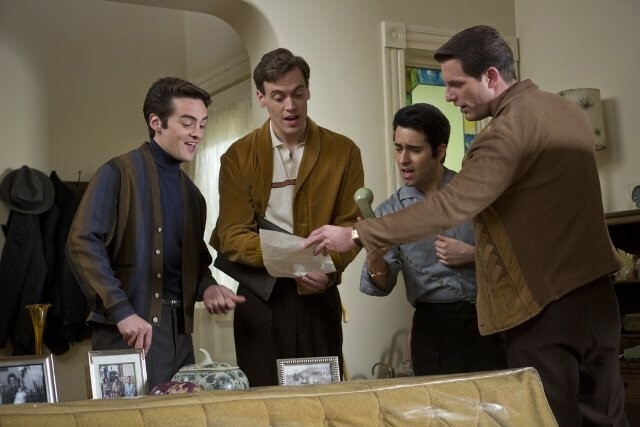 The movie tells us the success story of Frankie Valli (John Lloyd Young) and the other members of the Four Seasons as moving around their respective viewpoints. First, we are introduced to Tommy DeVito (Vincent Piazza), a cocky young man who seems to know everyone in his neighbourhood in Belleville. While working for a local mob boss Gyp DeCarlo (Christopher Walken), he introduces his close friend Frankie to Gyp, and Gyp quickly becomes an early supporter of Frankie, who has been a mere barbershop boy but may be a big star someday considering his fabulous singing talent. 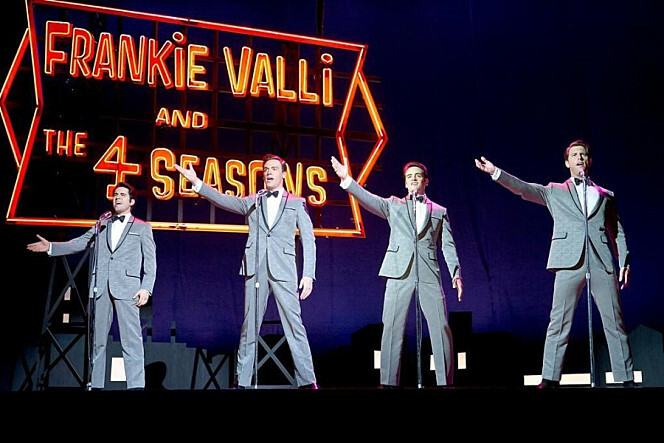 Mainly through Tommy’s viewpoint, the movie shows us the early struggling years of Tommy, Frankie, their friend Nick Massi (Michael Lomenda), and their new member Bob Gaudio (Erich Bergen), who happens to join the group through the recommendation of Tommy’s friend (and future Oscar-winning actor) Joe Pesci (Joey Russo). Although success seems to be forever out of their reach at first, they keep trying hard after they changed their band name to “The Four Seasons”, and they are eventually picked up by a well-known record producer Bob Crewe (Mike Doyle), who is apparently a gay but only baffles the boys as a rather odd guy (this is the 1950s, you know). But then, as told to us by Gaudio at this point, they have to go through another stage of struggle. As they become frustrated with always being hired as the backup singers for other musicians, they come to realize that they need something really good enough to convince Crewe and others that they deserve a breakthrough, so Gaudio, who has been in charge of writing songs for the band, writes “Sherry”, which becomes the first major hit for the boys. The screenplay by Marshall Brickman and Rick Elice, who adapted their book for the stage musical version, follows a familiar plot we have seen countless times from other movies about show business characters. While Frankie and the other band members enjoy more of their success with rising popularity, personal conflicts begin to grow inside and outside their band; Frankie comes to divorce his wife after long years of estrangement caused by his frequent tours and occasional infidelity, and Gaudio sees that the other band members are expendable compared to him and Frankie, and Tommy becomes far less responsible as his debt problem is getting bigger like a rolling snowball – and Nick is getting sick of being Ringo Star of his band. Unfortunately, none of these conflicts is not equipped with enough interest or character depth to hold our interest. While continuing to give us the performance scenes of their popular songs such as “Big Girls Don’t Cry” (I must confess I never knew this song was one of their major hits even though I have been familiar with it for years), the movie becomes choppier as jumping from one moment to the other through many contrived plot turns, and we come to see more of its inherent flaws in story and characterization. Except Christopher Walken’s character, most of supporting characters are uninteresting in their thin characterization, and Renée Marino, who plays Frankie’s bitter wife, and her fellow actresses in the film are unfortunately stuck with a thankless job of playing underwritten characters whose main sole function is telling the boys how lousy they are with their life and women. For the director Clint Eastwood, the movie was probably an attempt both interesting and challenging. While he previously made solid music drama films such as “Honkytonk Man” (1982) and “Bird” (1988), he had a little experience with musical films except his infamous musical performance along with Lee Marvin in “Paint Your Wagon” (1969), but I must say it is certainly interesting to see this 84-year-old director trying a new territory like another actor/director star John Huston did through “Annie” (1982) during his late career. However, although Eastwood did not do any sloppy job in providing an appropriate period background for the story and characters, his leisurely direction does not help much in case of covering the flawed narrative of the film. The performance scenes usually feel reserved and hesitant even though they are not lazily executed on the screen, and, if you are not that familiar with the stage version, you may even come to wonder how the hell its stage version became a big Broadway hit. While they are believable in their music performances as required, the main actors try as much as they can do with their rather bland characters. 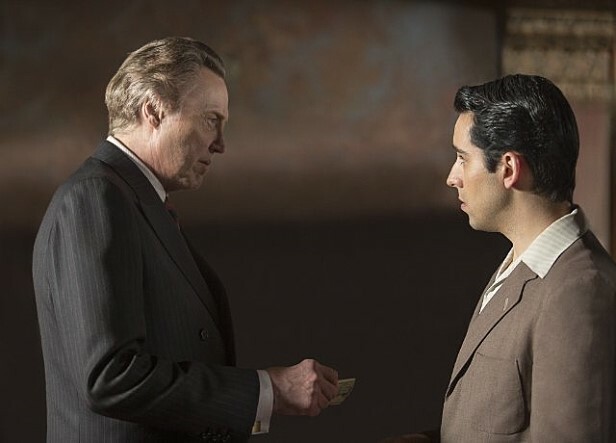 While Vincent Piazza brings considerable edge to his increasingly unlikable character, John Lloyd Young, who won a Tony award for his performance in the stage version, is wonderful in channeling that popular singing style of the 1950-60s, but I must point out that his character’s drama scenes do not come with enough gravitas to hold the ground. While Erich Bergen and Michael Lomenda do their job as demanded by their functional roles, Mike Doyle brings a sense of fun to the screen as a flamboyant record producer, and Christopher Walken effortlessly steals the show as usual whenever he appears in front of the camera. During one dramatic scene when his character has to take care of the boys’ very difficult situation as a favor to Frankie, Walken simply anchors the scene with his character’s no-nonsense attitude while never raising his voice, and you will see again why he is one of the most valuable scene-stealers in Hollywood. 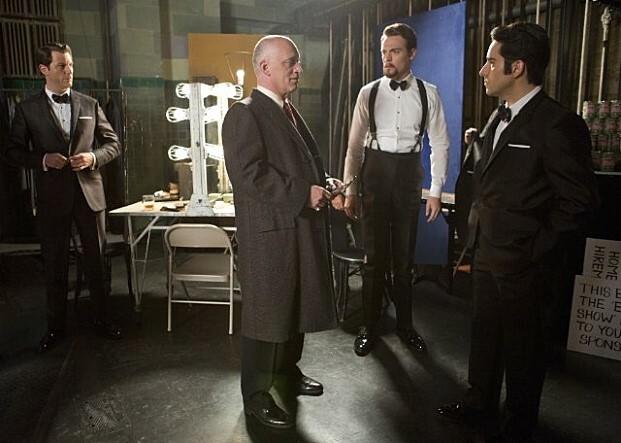 “Jersey Boys” is not without good things, but it fails to excite me on the whole, and this will probably be remembered as one of Eastwood’s minor misfires in his bountiful directorial career. While some of his unusual attempts resulted in good works like “The Bridges of Madison County” (1995), this is not the case here, and we can only guess how the movie could have been much better as watching its lackluster ending being followed by something far more energetic than the rest of the movie. This entry was posted in Movies and tagged Musical, Musician, Real-life figure. Bookmark the permalink.